I am from 13 to 17 years old. Do my parents have to accompany me at the convention, or attend the convention? From 13 to 17, minors may feel free to enjoy the convention on their own, with or without their parents, once the minor has their membership badge. We do recommend careful planning of meet times and contact plans if minors wish to spend extended time on their own. 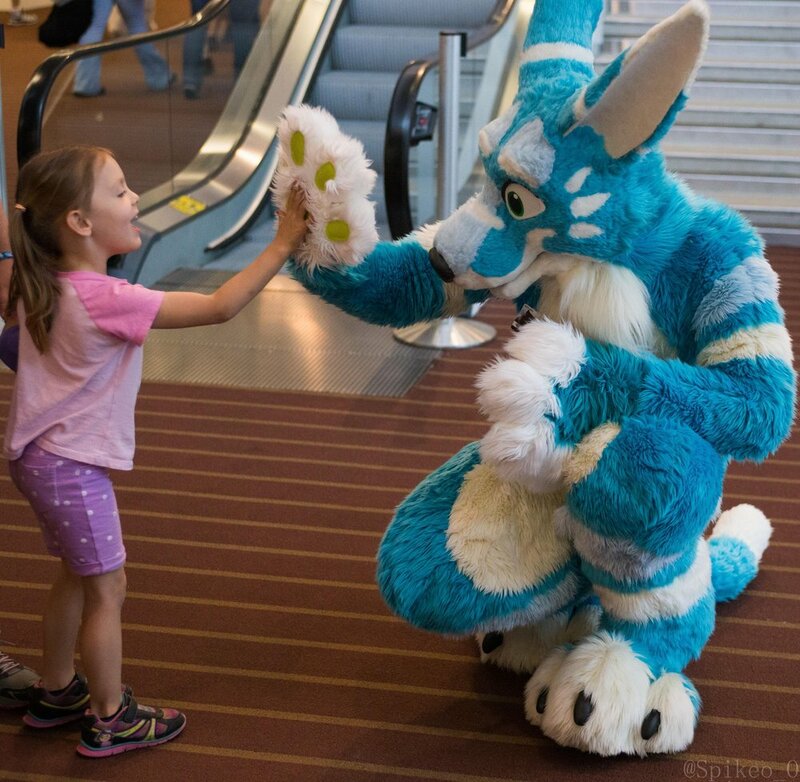 Parents are very welcome to purchase their own membership and attend Anthrocon, but do not need to. I am not yet 18, but I will be 18 before or during the convention. Do I have to wait until I turn 18 before I can register? No, there's no need to wait. As long as you will turn 18 before the convention starts, you do not need to have your parents' permission -- although if you live with them, we really do recommend you let them know where you will be. No use making them worry! If your 18th birthday is during the convention, you must have the signed permission form and will be issued a minor badge. You may exchange your minor badge for an adult badge free of charge at Registration on your birthday. Can an older brother/uncle/family friend sign for me? Can I get a hotel room on my own? No. You must be 18 to get a hotel room. If you will be staying overnight, we strongly recommend against making rooming arrangements with anyone that you do not know personally (and by that we mean face-to-face, not someone you met over the internet); better still, it should be someone that your parents have met and whose company they approve. Anthrocon prides itself on providing a safe environment for its Members, but we are nonetheless a large gathering of people from all parts of the world, and one should be appropriately cautious. If you must room with newly met roommates, it is wisest to make sure your parents have their complete contact information, have spoken with them, and have their trust. I am an emancipated minor. What do I do about a permission form? Emancipated minors need to bring court documents that prove that legal status. You will still be issued a Minor badge, but will not need any permission forms. I am a minor from outside the USA, and notarization does not exist or is incredibly expensive in my country. What should I do? Contact us ahead of time and we'll discuss your options.